If you decide to get custom garage cabinets, then there are a few things you need to think about before making any final decisions. Are Garage Cabinets Worth It? Garage cabinets can be a wonderful addition to any home, but they can also be a significant investment. While they certainly won’t cost you a fortune, they will cost enough that you should make intelligent decisions when choosing what type of cabinets to have installed. The last thing you want is to spend your money and get custom garage cabinets, then end up unhappy with them. This is your home we are talking about, so take the time to consider all of your options before settling on anything. This will help to ensure that the garage cabinets you end up with are ones that you are happy with. Melamine storage cabinets offer a number of major advantages that should make any homeowner happy to have them installed in their garage. After you learn about the many advantages that they offer you will probably realize that this material is an ideal one, and it should be your first choice. If you are going to get custom garage cabinets then the smart move would be to get garage cabinets that will be long lasting and add as much value to your home as possible. The point here is that if you are going to spend your money and get garage cabinets, then you might as well have the project done the right way. What is melamine and what makes it a great choice for garage cabinets? Melamine is a high tech resin that can be colored, patterned and shaped. The result is a lightweight, yet surprisingly durable substance that is ideal for cabinets and other similar types of projects. Melamine offers performance similar to that of a solid wood cabinet, but it does it at a fraction of the price. Melamine cabinets differ from fiberboard in that it isn’t a composite material, and it doesn’t show wear and tear as quickly. 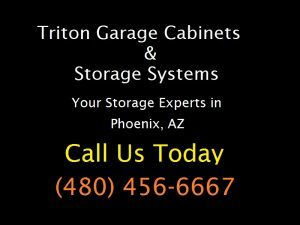 Whatever type of garage cabinets you’re looking at, make sure you visit a garage cabinet showroom in Phoenix.